Blurb : Trapped in the mysterious Castle Amber, you find yourself cut off from the world you know. The castle is fraught with peril. Members of the strange Amber family, some insame, some merely deadly, lurk around every corner. Somewhere in the castle is the key to your escape, but can you survive long enough to find it? Synopsis of Plot : The characters camp out one night in heavy mist whilst making a cross country journey and awaken in the morning, to find themselves in the foyer of a mysterious chateau or mansion, (not in fact a castle), surrounded by thick mists. Travel through the mist is impossible they must investigate the chateau, which has been cut off from the rest of the world by an ancient curse. 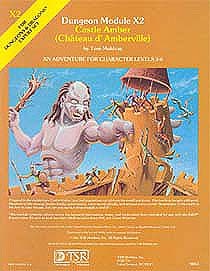 The chateau is home to the weird d'Amberville family and in the course of their exploration of the mansion they find that to escape they must defeat the curse. Their efforts to do so take them to a province of another world ("Averoigne") where customs are different and all magic use is regarded as evil. This is a great fun adventure which can be pretty much placed anywhere. The various members of the mostly mad Amber family control sections of the chateau and that makes for a large dose of variety. And it isn't all fighting, most family members are mad, but they can be spoken to and in some cases negotiated with.The variety works well, but it can seem a little disjointed which isn't helped by the fact that the layout of some areas is nothing more than a collection of rooms. When the PC's travel to Averoigne where magic is feared they really need to think carefully about how they behave and interact with the inhabitants and work out who the good and bad guys are. Overall, it's a bit of a thinking persons dungeonfest, big on action but with ropy believability. I have run this twice and each time it went really well, but that was some time ago and I would certainly make a few changes. Best Action Remembered : When I was at Polytechnic in the UK I DM'd for a mixed bag group of outright beginners and seasoned veterans. The final encounter in the land of Averoigne takes place with an evil wizard and during a tense meeting he launches a surprise attack, leading with a Prismatic Spray. After resolving the effects of the spray on the party I go round the table and ask each character what they want to do. First up is a Human Cleric who was hit by one ray causing damage; I fall to the floor with my back to the wizard . He then adds, while on the floor I'll try and take out my scroll of Blade Barrier while remaining as still as possible . This is a seasoned players response. The next player, an enthusiastic newcomer to the game playing a gnome illusionist whose spells have run out, replies I draw my dagger and run forward to attack! . Most amusing. Good Points : The rooms of the mansion are highly varied and contain many interesting NPC's, making exploration interesting for the players. Being faced with a new world featuring different customs and attitudes than those that the player characters are familiar with also offers the potential for creative role playing. Bad Points : The module is designed for original D&D, not Advanced D&D, but conversion by the Dungeon Master should be fairly straight forward.